I have spent the last several years pouring through investment books and financial literature and these are in my opinion, the best books of the investing genre - starting from a beginner level going to a more advanced level. Finish reading all of these and you can skip that MBA in finance. There are also a few links to valuable websites. Click through the image to go to the Amazon site. This is a true beginners book for the newbie investor, but provides a sound foundation. It covers the essential basic principles of value investing like margin of safety, economic moats, financial statements and valuation. The thing that really differentiates this book is that it devotes a chapter (total of 13) to almost each sector of the stock market (Banks, Pharma, Software, etc) which serves as a really valuable primer for a new industry you might not know much about. Valuation is critical to any investment decision. Damodaran is a well-respected professor at NYU and is considered the king of valuation. 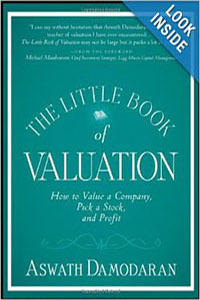 This book does a great job at simplifying the art and science of valuation for even the novice investor. It is a short read that can be covered in a few hours. Damodaran's website also provides a wealth of valuation information. The title is an homage to Benjamin Franklin's Poor Richard's Almanack and the content is brilliant. Poor Charlie's Almanack is a compilation of Charlie Munger's (Buffett's right hand man) speeches, lectures and other commentary all rolled up into one absurdly heavy and awkwardly large coffee table book. The book reads like a stream of consciousness of Munger, which is wonderful if you're like me and eat that stuff up. It includes a little background on the life of Munger, some highlights from annual meetings and many speeches and talks that Munger has given over the years supplemented with colorful illustrations and images. It is a combination of worldly wisdom and investment philosophy including topics like mental models, moats and the multi-disciplinary approach. While you might be able to find some of this info for free online, the format of the book is very engaging and easy to read. Buy it here (not sold on Amazon) and keep it at your bedside for the rest of your life. While the title makes it seem like it is a book about "Get Rich Quick" schemes Greenblatt has an amazing track record and provides some great advice, especially on spin-offs and special situations. These are the words straight from the Oracle of Omaha (Warren Buffett) himself. Cunningham has compiled 700+ pages of Buffett's shareholders letters and organized them thematically into categories like Corporate Governance and Valuation and Accounting. While you can access all of Buffett's shareholder's letters for free online at the Berkshire Hathaway website, this is an easier way to digest the most relevant golden nuggets contained in the intimidating and lengthy letters of the last several decades. On occasion, Warren Buffett has said that he is 85% Graham (see The Intelligent Investor below) and 15% Fisher. Fisher walks you through his investment decision process which includes the 15 Points to Look for in Every Stock, When to Sell and Five Don'ts for Every Investor. He also introduces us to the concept of the Scuttlebutt Method (hence the name of this site). Fisher's approach to investing is very different from traditional value investing and I would be reluctant to call his investing style value- Growth at a Reasonable Price (GARP as many refer to it) would likely be more appropriate. 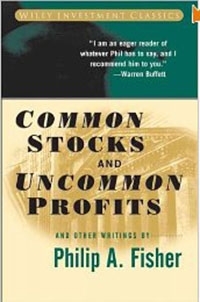 But overall this is one of my favorite books in the investing genre because Fisher's described approach to investing is novel as compared to any other literature on the subject. Originally written in 1949, but still just as relevant today. Graham's protege, Warren Buffett, describes this book as "by far the best book on investing ever written". Buffett swears by Chapters 8 and 20 which discuss now popular principles of investing like Margin of Safety and Mr. Market. It's not the easiest read though and some of the chapters can be dense. Luckily this version has explanatory chapters after each existing chapter written by Money magazine columnist Jason Zweig that contain more modern day examples. Marks is the founder of Oaktree Capital Management and is widely known in the investment world for his insightful quarterly letters. However you won't find any valuation formulas, technical analysis tips or anything like that here. What you will find is a comprehensive analysis of the qualitative and psychological factors that move the market and how to invest amidst these factors. Marks discusses concepts like second level (contrarian) thinking, market efficiency, valuation, risk and market cycles in a way that is incredibly simple but that sheds new light on these topics. While still an easy and valuable read for the novice investor, experienced investors will get far more value out of this book as they try to balance their quantitative strategies with strategies to keep their emotions in check. Since the release of this original version, a new version called "The Most Important Thing Illuminated" has been released featuring additional commentary from respected and renowned investors like Seth Klarman and Joel Greenblatt.